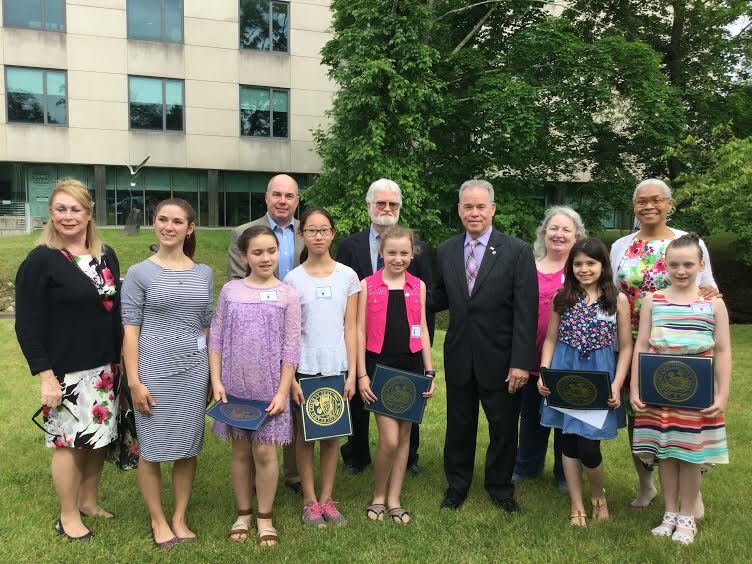 Rockland County Executive Ed Day congratulated six students who won the 26th annual Eleanor Burlingham Earth Day essay contest in an awards ceremony Thursday. Five of the students wrote about recycling and one wrote an essay about a tree her grandfather planted in her backyard. The winners were: Ramapo Central’s Viola Elementary School students Emma Chin, Anna Moetzinger and Alyssa Weinstein; Nanuet School District’s A. MacArthur Barr Middle School students Kierra Devine and Caroline Brennan and Christopher Buchauer of Nyack, who is homeschooled. The contest is run annually by the Rockland County Environmental Management Council in memory of Rockland environmentalist Eleanor Burlingham.